Comics Experience General Manager and writer Rob Anderson recently appeared on the Discussions with Decapitated Dan podcast, Episode #90, and discussed Comics Experience, in addition to his recently released comic book, Rex, Zombie Killer. During the show, Rob discusses how he got involved in creating comics, joined Comics Experience as a student, and eventually became part of the staff. He also gives an overview of the history of Comics Experience, talks about Andy Schmidt's background in the industry, and the Comics Experience curriculum. Plus, if you've ever wanted to know more about the Creators Workshop community -- how it works, the professionals involved -- Rob gives a run-down of that as well. 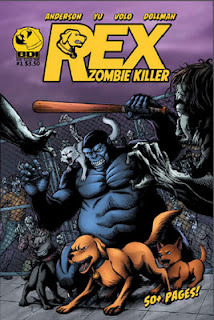 The interview begins with Rob talking about his new comic book, Rex, Zombie Killer. Published by Big Dog Ink, the comic hit shops yesterday, May 2, 2012. In addition to Rob, the creative team includes artist DaFu Yu (CE alum), colorist Kevin Volo (CE alum), letterer/designer ET Dollman (CE Workshop member) and editor Paul Allor (CE staffer and alum). Although Comics Experience members' books appear in comic shops on a regular basis, Rex, ZK marks the first time that a creative team on a book solicited in Diamond Previews (and available to comic shops) is made up entirely of Comics Experience Workshop members, alumni and staff. Listen to the podcast interview with Rob right here. Discussions with Decapitated Dan is a weekly podcast where host Dan Royer interviews horror comic creators, publishers and fans. His recent guests have included creators such as Terry Moore (Rachel Rising), Kurtis Wiebe (Green Wake), and Creators Workshop member Brandon Seifert (Witch Doctor). Dan's podcast is available on iTunes, and is also syndicated through other comics news sites such as Comic Related, Comic Attack, Chicago Comic Vault, Drive Thru Comics, and more. Dan is also the founder of the Chicago-area DanCon convention, as well as the founder of the Ghastly Awards, which recognizes outstanding achievements in Horror Comics over a range of 15 different categories. Ghastly Awards nominees are chosen by other horror comic book professionals and winners are chosen by a panel of judges.